I love fresh crabs and when I'm not cooking my national dish, Singapore chilli crab with these beautiful crustacean, I tends to make these delicious crab cakes. Chesapeake crab cakes hailed from Maryland and is a specialty of this America east coast state. The traditional crab of choice for this is blue crab which is widely available in Chesapeake Bay, but unfortunately not as common here in the UK so I use the native variety for this instead. The secret to a great crab cakes is that unlike the normal fish cakes, these should be packed full of crab meat with little fillers. So no mashed potatoes to bulk up the patties and keep the breadcrumbs to a minimum so as not to lose the sweetness of the crab. 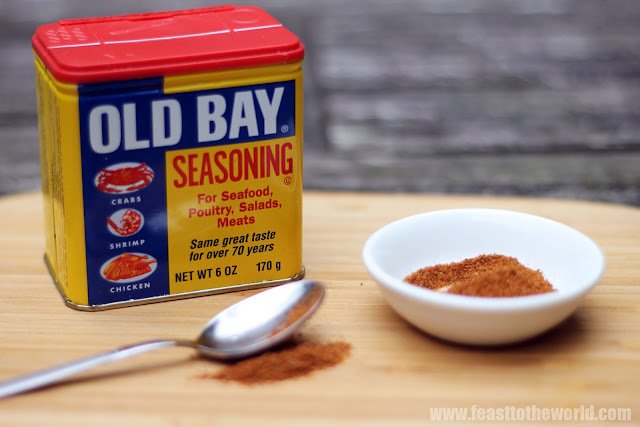 Another secret to a good crab cakes is the Old bay seasoning. Old bay is a Creole spice blend that contains celery seed, mustard, bay leaves etc and is vital for giving the crab cake its distinct flavours, without which it will not be authentic. This is also an integral ingredient for making the famous Southern Fried Chicken or the traditional crawfish boils. You can easily get hold of this online or if you live in London, this is available in the USA Foodstore in Notting hill. If you haven't the time to cook a whole crab and pick the meat yourself, try to go to a good reliable fishmonger and ask for those that been professionally picked and replaced in shell. These will generally have a better amount of big lumps of white meat. Use those that comes in tub as an alternative but tin crab is a definite no-no as the end results will be insipid and disappointing. Make sure you give the formed crab cakes ample time to chill and set in the refrigerator before frying. This will prevent them from losing their shape and falls apart. 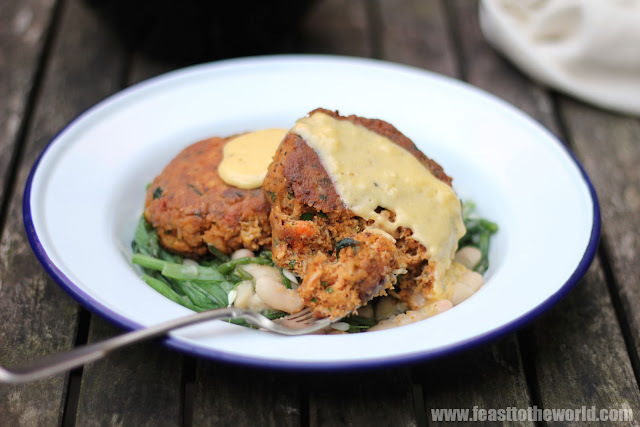 This is delicious with a simply dressed salad or try it in place of beef patties for a burger with a twist. Here, I have served mine with a cannellini bean stew which makes for a more substantial meal but however you want to serve it, make sure you have plenty of fresh aioli to go with it. Seeing that it's American's Independence day, why not give this or my Southern fried chicken a go to celebrate? "Happy Independence day to all my American readers ! " Combine the crab meat, breadcrumbs, old bay seasoning, mustard, paprika, cayenne pepper, tarragon, parsley , eggs and season with salt and pepper.Go easy on the salt as the old bay seasoning already contain salt. Mix well and form into 6-8 equal size cakes. Refrigerate for 30 minutes to help the cakes bind. To make the aioli, blend the egg yolks, mustard, garlic and lemon juice in a food processor and whizz. Gently pour in the olive oil gradually, until they are completely incorporated and emulsified into a thick mayonnaise consistency. Season with salt and pepper to taste. Dust the crab cakes in flour. Heat some oil in a large frying pan over medium heat and fry the crab cakes for 3-4 minute on each side until they are golden brown. 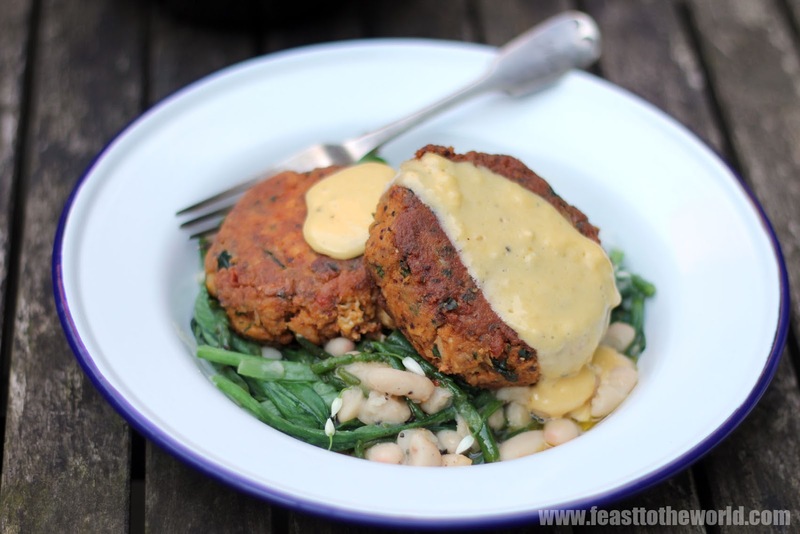 Serve with a dollop of the aioli and a light salad or the optional cannellini beans for a more substantial meal. To cook the beans, boil the soaked in plenty of water for an hour, until soft and drain. Skip this step if using tinned beans. In a large pan, melt the butter with the olive oil over medium heat. Add the cooked beans along with the white wine and lemon juice and cook for 3- 4 minutes. Turn off the heat and add the spinach and stir to wilt in the residing heat. Season with salt and pepper to taste. Serve with the crab cakes. Thanks for this recipe.. I tends to make these delicious crab cakes.